Agrianian peltast. This peltast holds three javelins, one in his throwing hand and two in his pelte hand as additional ammunition. A peltast (Ancient Greek: πελταστής peltastes) was a type of light infantry in Thrace and Paeonia who often served as skirmishers. Peltasts carried a crescent-shaped wicker shield called a pelte (Latin: peltarion) as their main protection, hence their name. According to Aristotle, the pelte was rimless and covered in goat or sheep skin. Some literary sources imply that the shield could be round, but in art it is usually shown as crescent-shaped. It also appears in Scythian art and may have been a common type in Central Europe. The shield could be carried with a central strap and a hand grip near the rim or with just a central hand-grip. It may also have had a carrying strap (or baldric) as Thracian peltasts slung their shields on their backs when evading the enemy. Peltasts' weapons consisted of several javelins (akontia), which may have had throwing straps to allow more force to be applied to a throw. Alexander the Great employed peltasts drawn from the Thracian tribes to the north of Macedonia, particularly the Agrianoi. In the 3rd century BC, peltasts were gradually replaced with thureophoroi. Later references to peltasts may not in fact refer to their style of equipment as the word peltast became a synonym for mercenary. A tradition of fighting with javelins, light shield and sometimes a spear existed in Anatolia and several contingents armed like this appeared in Xerxes I's army that invaded Greece in 480 BC. 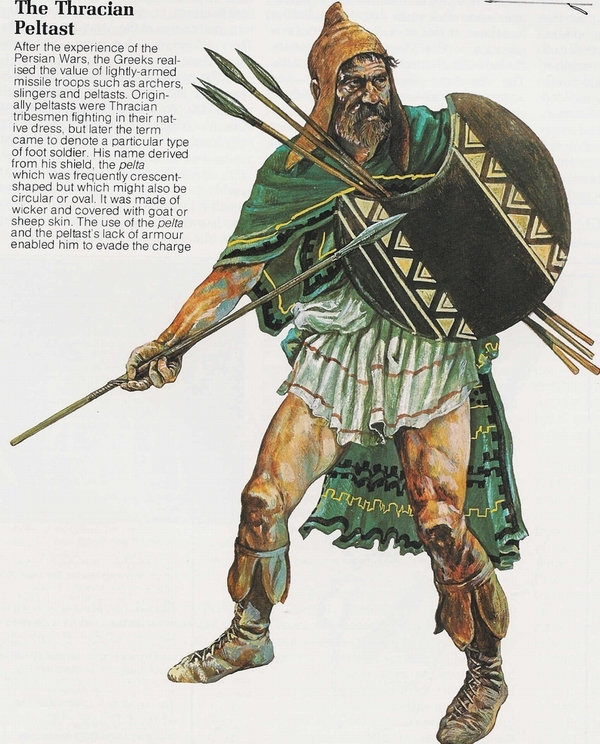 For example, the Paphlagonians and Phrygians wore wicker helmets and native boots reaching halfway to the knee. They carried small shields, short spears, javelins and daggers. From the mid 5th century BC onwards, peltast soldiers began to appear in Greek depictions of Persian troops. They were equipped like Greek and Thracian peltasts, but were dressed in typically Persian army uniforms. They often carried a light axe, known as a sagaris, as a sidearm. It has been suggested that these troops were known in Persian as takabara and their shields as taka. The Persians may have been influenced by Greek and Thracian peltasts. Another alternative source of influence would have been the Anatolian hill tribes, such as the Kurds, Mysians or Pisidians. In Greek sources, these troops were either called peltasts or peltophoroi (bearers of pelte). In the Hellenistic period, the Antigonid kings of Macedon had an elite corps of native Macedonian 'Peltasts'. However, this force should not be confused with the skirmishing peltasts discussed earlier. The 'Peltasts' were probably, according to F.W. Walbank, about 3,000 in number, although by the Third Macedonian War this went up to 5,000 (most likely to accommodate the elite Agema, which was a sub-unit in the 'Peltast' corps). The fact that they are always mentioned as being in their thousands suggests that, in terms of organization, the 'Peltasts' were organized into chiliarchies. 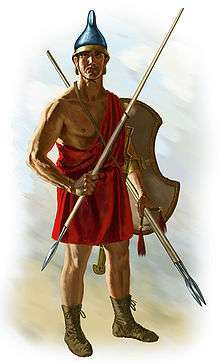 This elite corps was most likely of the same status, of similar equipment and role as Alexander the Great's Hypaspists. Within this corps of 'peltasts' was its elite formation, the Agema. These troops were used on forced marches by Philip V of Macedon, which suggests that they were lightly equipped and mobile. However, at the battle of Pydna in 168 BC, Livy remarks on how the Macedonian 'Peltasts' defeated the Paeligni and of how this shows the dangers of going directly at the front of a phalanx. Though it may seem strange for a unit that would fight in phalanx formation to be called 'peltasts', 'pelte' would not be an inappropriate name for a Macedonian shield. They may have been similarly equipped with the Iphicratean hoplites or peltasts, as described by Diodorus. A peltast fighting a panther. 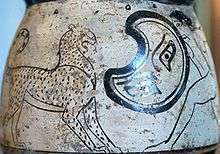 Side A from an Attic white-ground mug, early 5th century BC. Louvre Museum, Paris. ↑ Sekunda, Nicholas V (1988), p69.